On October 17th, we hosted an amazing panel of five alumni who shared their experiences being out in the workplace. Sitara Herur, a GS student and leader within the LGBTQ student community at Columbia, moderated the panel. The panel was followed by a networking event with additional alumni joining us to meet and connect with students and other alumni. Throughout the night, the alumni shared their experiences and tips for students. When Sitara asked panelists how their LGBTQ identity impacted their career choices, they shared a number of factors to consider. A work environment where you don’t have to hide your identity: Ramond Curtis, a US Army Combat Veteran, now working in veteran advocacy and activism with Common Defense PAC, spoke about how important it is for him to be comfortable in his work environment. He wants to be able to share personal stories with colleagues and not feel he has to hide his identity. A location where its easier to be LGBTQ: Carlos Cruz spoke about his career trajectory in global product development in the fashion industry and shared that location was a factor that influenced his decisions. He had opportunities that he turned down in favor of locations where it is easier to be an LGBTQ individual where he could feel comfortable talking about his personal life. A place that celebrates and seeks to recruit people with LGBTQ identity: Sean Ryan, who serves as McKinsey’s North America GLAM ambassador with a current project to lead LGBTQ recruiting efforts, said that he evaluates the organizational structure to determine how much ownership he will have over his work and schedule. He said that being out has created opportunities for him and he’s sought workplaces that celebrate and seek to recruit people with his LGBTQ identity. A situation where you can bring marginalized identities into the space: Lowell, a first-year Greene Public Serve Scholar at Columbia Law School, has many years of experience in queer advocacy spaces. She seeks opportunities now where she may be one of only a few queer voices who help bring the intersection of marginalized identities into the space. She’s found that opportunity in women’s advocacy groups. Deciding how and when you share your LGBTQ identity is a personal decision that each person must make. Ramond spoke of research on the negative mental health impact of concealment and encouraged people to think about what is right for them. Know the difference for yourself between being a private person versus being constantly on guard about what you talk about in relation to your identities. Ramond encouraged students to speak clearly and not in vague terms about themselves. He uses husband and not partner to be clear about his life and normalize his experience in conversations. It’s been a great way for him to evaluate organizations and groups. He’s found that people respond better when he is not vague and he sets the tone. You have to be ready for moments of surprise on people’s faces when you first mention something unexpected but you can move past that quickly with practice. Stevie Aligbe, an automation tester, game developer, and software engineer said that she found a peer group of queers who support and mentor each other. She encourages students to push the needle by advocating to make the workplace more inclusive. She provided as an example that she and her peers were able to add a custom field for pronouns to her organization’s communications tool, Slack, that made visible how people wanted to be addressed. Stevie also shared that if you are hurt by something someone says, let them know. You can be both nice and strong at the same time. Ramond echoed this sentiment by suggesting don’t take ignorance personally, it’s ok to educate, and don’t be afraid to correct someone. Several panelists encouraged students to create good spaces for themselves by asking friends and close colleagues to use your preferred pronouns so others hear them and can follow suit and use them. They spoke of the value of mentors and allies who may be peers within or even outside your workplace. Additionally, panelists discussed how they can support inclusion by influencing wording in job descriptions and joining hiring teams to champion LGBTQ recruitment. The suggestion was also given to ask recruiters to introduce you to someone like you from the company to gain a better understanding of the workplace culture of inclusion. Celebrate and advocate for different identities and consider the intersectionality of identities to broaden the conversation about people and hiring. Caitlin said that many people sincerely want to help you to reach out and let them know about your job search as they will help you reflect on what you bring to the table. You don’t have to job search alone! 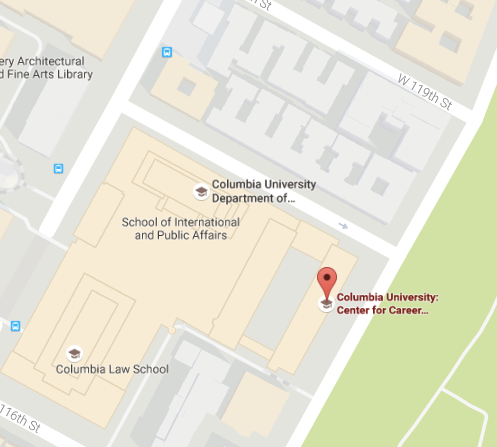 Stay in touch with your network at Columbia among the faculty, advisors, and peers as they also will help you. Want more information on your LGBTQ career path? Check out our LGBTQ resource page.